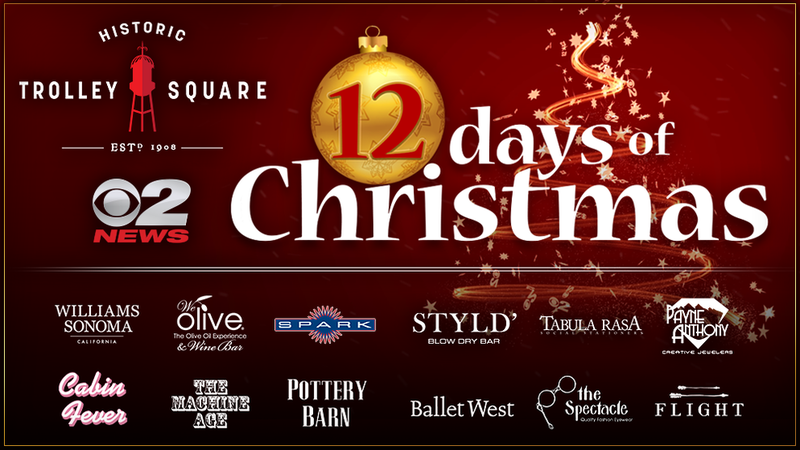 Enter to win prizes from stores in Trolley Square during our 12 Days of Christmas Giveaway. Starting Monday, December 11th and running through Friday, December 22nd. Enter during the morning show (4:25a to 7:45a weekdays, and 7:00a to 7:45a on weekends). VISIT THE WEBSITE TO FILL OUT THE FORM AND ENTER TO WIN! Day 4 - Thursday, December 14th: STYLD, Trolley Square Barbers and Season's by David - $250 Gift Card to STYLD; Blow Dry Bar; $55 Gift Certificate for Grooms Haircut, Hot Lather Shave and Deluxe Shoe Shine at The Trolley Square Barbers; $500 Gift card for Wedding Floral Arrangements from Season's by David - $805 Total value. Day 6 - Friday, December 15th: Tabula Rasa - Michael Michaud Bonnet Orchid Necklace ($88); Pewter Antler Letter Opener with stainless steel blade, handcrafted in Italy ($74); $100 Gift Card to Tabula Rasa - $262 Total value.